This summer I came to Tuscarora to enjoy a final summer before entering the “Real World”. Come December I will be finishing graduate school and be faced with the prospect of finding a normal 9-5 job, thus I decided that instead of looking for a summer internship I wanted to spend my summer somewhere exciting and adventurous, so I came to work at Tuscarora Outfitters on the Gunflint Trail. Here I expected to work hard but also to spend my time off exploring the wilderness of Northern Minnesota and the BWCA. 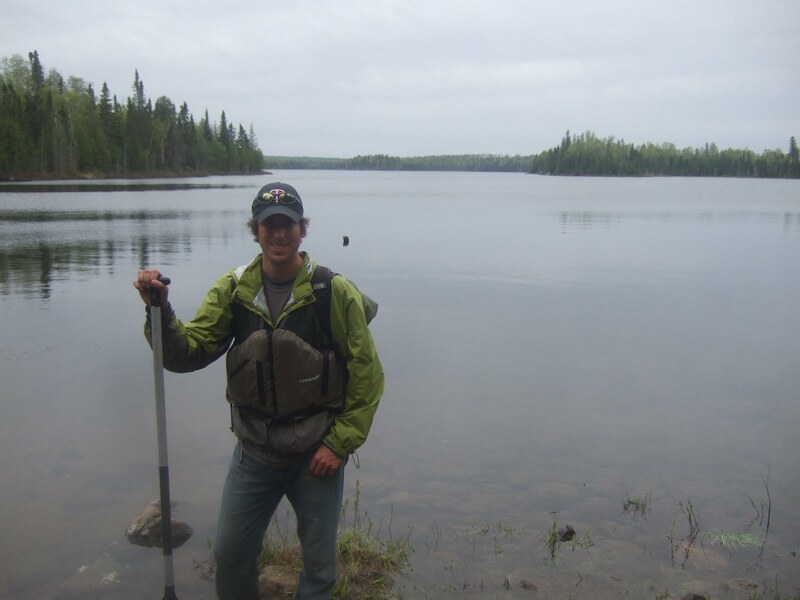 Two weeks ago another staffer, Andrew Yates, and I went on our first overnight BWCA trip of the summer. Neither Andrew nor I had seen much of the area around Tuscarora so we decided the goal of our trips was to “Make Tracks” and see as much of the surrounding area as we could during our day off. I would have to say that we were completely successful in our goal as in 23 short hours (12 of which we were making camp) we covered 22 portages (totaling over 1,300 rods), 21 total miles and over 20 different lakes! We set out at 3:00 pm after work on Monday (May 31st) from Round Lake and headed to Tuscarora Lake, where we had originally planned to camp for the night. On our way we got to do the legendary Tuscarora Portage, which depending on which map you consult is anywhere from 360-425 rods (anyway you look at it, that is long and over a mile). A personal point of pride is that I carried our aluminum canoe over the entire portage! When we got on Tuscarora it was still early and we had favorable winds so we decided to keep going instead of making an early camp. The result was we were able to make it to Crooked Lake and find a suitable campsite by around 6:00 pm. In camp we enjoyed the delights of expired dehydrated foods (which we get for free from Tuscarora Outfitters as they cannot sell it to clients), a campfire, a beautiful sunset, and starry night (complete with loon calls and beaver tail slaps). Tuesday morning (June 1st) we got up at sunrise, packed up camp, and were canoeing again by about 6:00 am. As there had been decent winds the day before we decided we wanted to get out early in order to get to Little Saganaga before any major winds camp up (Little Sag is a big lake, despite its name, and unfavorable winds would have made canoeing it very difficult). When we arrived at Little Sag the wind was just getting going for the day, but lucky for us it was mostly at our back. As the wind increased we decided that we would take a chain of smaller lakes back to Tuscarora Outfitters in the afternoon as opposed to going into other big lakes such as Gabimichigambi and Peter Lake. The result of this decision was a lot of portages! Despite our aluminum canoe though we only had one big pack and a small backpack so there was no double portaging for us. Our final stop on our trip was on Bat Lake, where we stopped for a quick lunch at midday, before we finishing the last leg of our journey that afternoon. Overall it was a great first trip! We managed to see a big portion of the BWCA that is right in our backyard. It is great having seen all these lakes as many of them are ones that our clients here at Tuscarora are constantly going on trips to, thus now when they ask us questions ahead of time or tell us about their trip afterwards we will be more knowledgeable about the area. Finally it is good to know that it still only mid-June and that there will be many more trips yet to come as a part of this summer adventure in the BWCA.